I often share the story about my adventure with my friend Dan on the water. Dan invited me to go fishing with him once, which I was happy to accept. I was in the Air Force at the time and stationed in Idaho (there are some beautiful and great spots to fish at in ID). We set out with a small, metal boat attached to his pickup truck and headed to a local reservoir near the air base we were stationed at not knowing the perils we were about to face. Everything seemed okay as we cast the boat from shore. The sun was shining, the temperature was not too hot and not too cold. We rowed out to the middle of a tributary of the reservoir and cast our lines for a quiet time of fishing. After a little time on the water, we began to see a storm off in the far distance. Dan wasn’t to concerned and thought it would pass to the west of us. So, we continued to fish even though the storm continued to move our way. It wasn’t until the water began to become choppy that we decided to head back in but of course was too late. As we began to paddle, the choppy water began to hit against the side of the boat, the wind had also picked up and began to push against our attempts to get to shore. To make things worse, it began to rain, not a nice summer shower but a straight downpour. The boat began taking on water and there were a few moments that I thought we might have to swim for it (thank goodness we didn’t I might not have made it). After what seemed a life time of paddling, tired and weary we made the shore line almost a half a mile from where we cast off and Dan’s truck was parked. When it comes to the story of the disciples in the boat with Jesus in the storm (Matthew 8 and Mark 4) I can relate. I could understand their panic as waves are battering them side to side, to see water filling up the boat and wondering if it was going to sink to the bottom. I would have been shocked to find anyone on the boat asleep let alone Jesus. The disciples, frantic for their life, wake Jesus and wonder if Jesus even cares that they might die. Jesus responds by calming the storm and then stating to His disciples, “Why are you so afraid? Do you still have no faith?” to which the disciples stand in amazement of Jesus and His power over nature. 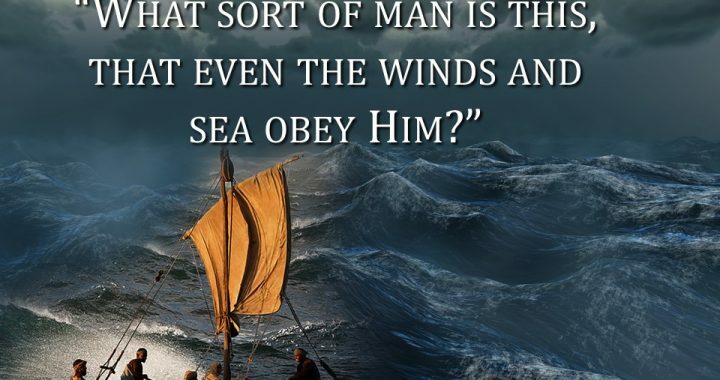 The thing about the disciples in the boat was that they didn’t have to worry, they had the Lord of this world with them. Their boat and lives were not in real danger (though it may have seemed to be) because God Himself was with them. The problem was the disciples didn’t realize it and we don’t either. You see the same Lord that calmed the storm on the boat with the disciples, is the same Lord that can see us through ours. We must have faith though, to face the fear of the storm not by ourselves and our own strength but by knowing Jesus is right there with you. Jesus who defeated death and sin is there with us. Whether we see the storm taken away, pass through the storm or we cross over with Him, as believers we know that life is eternal in Him. So today I ask why are we so afraid, do we still have no faith? Just for today: I will lift my eyes up to you, O Lord, and seek to tell you of my love for you. Just for today: I will lay all of my questions down at your feet and leave them there. 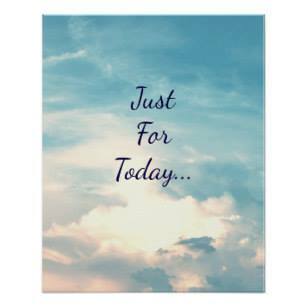 Just for today: I will express my praise for you. I will rejoice in who you are. Just for today: I thank you for all you have blessed me with. My life is so full. I heard an old, old story, how a Savior came from glory, How He gave His life on Calvary To save a wretch like me; I heard about His groaning, Of His precious blood’s atoning, Then I repented of my sins And won the victory. This is the beginning of a great old hymn of the church that I have sung many times growing up, but has taken me many years of spiritual growing up to come to an understanding of the truth in this song. 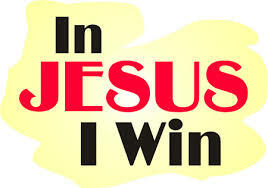 Victory is something we can have in our lives but only through Jesus. Jesus told his disciples, 33 “I have told you these things, so that in me you may have peace. In this world you will have trouble. But take heart! I have overcome the world.” (John 16:33 NIV) Jesus through his incarnation, life, death and resurrection defeated Satan and sin. It was through the Cross that sin’s full effect was laid upon our Lord. He took on man’s full disobedience and the penalty of said defiance, death. 1 Peter 3:18, “18 For Christ also suffered once for sins, the righteous for the unrighteous, to bring you to God….” Jesus fought the battle we could not fight ourselves and secured for us what we were unable to do. With this knowledge then, we can know how to have victory in our lives. Victory comes from our knowledge and faith in Jesus. I used to watch the GI Joe cartoons growing up and they would always say “knowing is half the battle.” When we read and learn about God, we gain understanding into the nature of who God is. As we dive into the scriptures, we see key attributes that can strengthen our trust in Him. God is all powerful, all present, gracious to us, caring, and all knowing, to name just a few. It is through coming to know Him that we can see God is the source of our victory. Jesus cares for our situation; gracious to pick us up if we fall, powerful to deliver us from our situation and faithful to be with us even in our deepest darkest moment in life (see Psalm 23). Knowledge of a God who cares and even shares in our afflictions (Jesus was tempted, mocked, despised, suffered pain) can help us gain the victory we need. With knowledge then, it becomes whether we have faith. Paul tells the church in Ephesus to take up the shield of faith (Ephesians 6) to protect against the attacks of Satan in our lives. Knowing facts about God takes us only so far; it is living in and out the knowledge we gain from the bible that faith is built. You see salvation is more than just gaining a ticket to heaven, to remove the punishment of our sins. Salvation begins a relationship with us and God through Jesus. Just like any relationship, it is built on a mutual trust, us placing our trust in God and God working through our lives. As we place our trust in the Lord, we begin to see the difference He makes. This may not always be instantaneous or without pain, but as we walk with Jesus, we can see the victories as we grow in Him. So, you might be asking, “what’s our part.” I think Jesus is the best example to use when it comes to this question. In Revelation 5, John gives us an imagery of Jesus that I think works well in our own lives. John is waiting for someone to be worthy of opening the scroll before God and it seems like no one can be found on, under and over the Earth, that is until an Angel tells him to take courage and look. John is told here comes the Lion of Judah, the majestic symbol of the King of Israel, One who has the power of God. As John looks however, he sees a lamb that is slain. In this symbolic picture of Christ, we can see how Jesus was victorious. The power of God working through the sacrifice of God himself. For us then, true victory comes when we sacrifice our wills to God and allow the power of the Holy Spirit to work Christ’s grace in us. Paul knew this when he told the Corinthian church, “9 But he [God] said to me, “My grace is sufficient for you, for my power is made perfect in weakness.” Therefore I will boast all the more gladly about my weaknesses, so that Christ’s power may rest on me.” Paul had a thorn in the flesh that he wanted God to take from him but the Lord would not remove it because it was through it that God’s power was displayed. It is the same for us, it is not about us fighting some spiritual battle by our own will and determination, but through a will handed over to Christ so that the power of our Lord might strengthen us to His glory and praise. What is your struggle today, where in your life are you needing victory? Have you prayed, have you searched the scriptures for God’s wisdom in your circumstance and have you fasted? Even more, have you laid it before the feet of Jesus where true victory has been won for us. Victory comes not through fighting, but through submitting to the one who fought for us.